Mrs. Wegner is originally from the Milwaukee area and attended Lutheran elementary grade schools and high school. She knew that she wanted to be a teacher since she was a little girl, and once old enough, spent much time babysitting and spending time with younger children in her neighborhood. As she began her Elementary Education degree at Concordia University – Wisconsin her love of teaching was confirmed and she finished with her Bachelor of Arts in Lutheran Elementary Education and minor in Language Arts. Mrs. Wegner is married to Mr. Wegner, our Principal at St. Paul. They have two sons, Tyler and Evan. Tyler works in Stevens Point and Evan is in 8th grade at St. Paul. 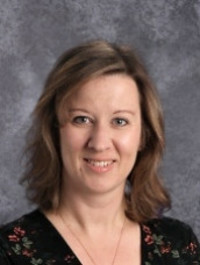 When not teaching, Mrs. Wegner likes to read, bake, walk their dog, boat and travel. She is thankful for being part of a wonderful staff and welcoming school family. She has been a member at St. Paul since 2015 when their family moved to the area and feels it is a blessing to serve with her husband and be at the same school as Evan.